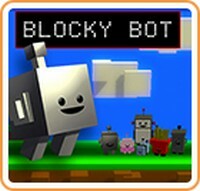 Family Friendly Gaming was provided a download code for Blocky Bot on the Wii U a few days before it was released. Mobot Studios makes solid home console video games. Blocky Bot reminds me of so many other video games. It is difficult like Flappy Bird. It keeps going up like Let's Jump. Blocky Bot is selling for $1.99, and it feels a lot like an app. Why is that? We jump up from platform to platform. There is no jumping from side to side. Stay on a platform too long in Blocky Bot and a black void swallows up the character you are playing. Touching boxes produces coins. Once the family member acquires one hundred coins they can purchase a new character. Then the family member can play that character or one of the other characters they have unlocked. Pro tip - going back and forth over a box may produce duplicates of the coins in that box. As I beat my high score I noticed I was getting new themes. This changes the music and graphical look in Blocky Bot. Off screen play is also available in Blocky Bot if you want to turn your television set off, or use it for something else while playing Blocky Bot. I need to warn you about Blocky Bot - this game is addicting. I kept wanting to get a higher score. Or enough coins to unlock another character. Blocky Bot is fun, and levels last as long as you can avoid the enemies. These enemies are such trolls at times. Controls can be a bit loose unless you use the D-pad. Even then I noticed I could jump up and through the enemies. I made sure to land away from them and I could keep going. It feels like everything in Blocky Bot randomly generates. I noticed certain patterns would repeat throughout the levels. The music in Blocky Bot is upbeat and exciting. There are some really bright and colorful levels in Blocky Bot. I found a grim reaper character in Blocky Bot. There are characters in Blocky Bot from other video games. I enjoyed finding them and remembering those other games. All in all I like Blocky Bot. This is a fun little downloadable only video game that contains plenty of characters and themes for replay. Blocky Bot is also a great opportunity to exercise self control when it comes time to quit.